Properties in Vinassan average 4.5 out of 5 stars. Our vacation home is located on the promenade & on the beach of Gruissan. Property 13: Our vacation home is located on the promenade & on the beach of Gruissan. New Mediterranean holiday house with large garden, 8 km to the sea. Property 24: New Mediterranean holiday house with large garden, 8 km to the sea. T3 100 m from the beach, in a recent residence. Property 40: T3 100 m from the beach, in a recent residence. 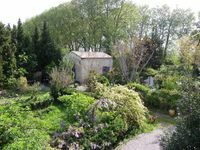 Jean-Claude and Maud have a wonderful property that backs up to the canal path. They are always on hand to help but are never intrusive.The kitchen is adequately equipped with a microwave and full-size stove and refrigerator. The two bedrooms are large and we slept very well there. As others have noted, Wifi can sometimes be spotty, but Jean Claude was able to solve any problems. It is a short drive to the center of historic Narbonne with its wonderful indoor Les Halles market, many shops and coffee houses. In the main square adjacent to the market there is a large underground parking garage where we were always able to find space. In the street next to Les Halles is a restaurant called A La Table Du Marche, which we particularly enjoyed. Be sure to make a reservation before going to the market, as it is very popular. There is plenty to see in or near Narbonne: Castelnaudry, home of the famous cassoulet, Carcassonne, Gruisan, the Abbaye de Fontfroide and picturesque villages along the Canal du Midi are all short drives away. This is a great place to stay that is relaxingly rural, yet still in close proximity to some of the most interesting spots in Languedoc. Languedoc offers many very tasty red wines - Corbieres, Fitou and Minervois were our favorites. Many thanks to Jean-Claude for the excellent bottle of Minervois that he gave to us. We enjoyed it! My wife and I were searching for a French property to buy and booked this Moussan vIllage home for its good location near many of the properties we had lined up to view. The quirky old layout of this home built into the stone heart of the village is enhanced by a very modern renovation that provides most of the mod cons anyone would require (short of a dishwaher I suppose). There is a really beautiful outdoor terrace with a plung pool/large hot tub (closed in Dec obviously) and this ambiance is truly 5 star French! In the bedrooms, there are comfortable beds, and auto lighting is helpful to get to the very nice bathroom in the night. Pros are numerous: -great character -beautiful outdoor space -very clean and modern space -most mod cons including good internet Cons: -super low to the floor sofa in lounge is quite uncomfortable -frustratingly obtuse entertainment situation (and I&rsquo;m a high tech geek!) featuring a receiver and speakers around the house with nothing to play aside from a second DVD player (?) Overall we enjoyed this peaceful village house and found it well situated to explore this part of Languedoc!